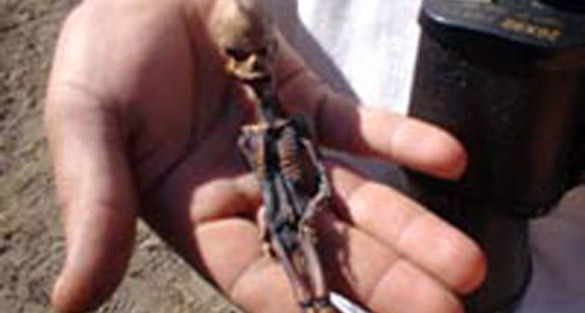 Greer’s alien was discovered by a treasure-hunter back in 2003, in the ghost town of La Noria in Chile’s Atacama desert (interestingly, a place considered similar to the Martian surface). The dessicated little skeleton, which is no longer than a pen yet has perfect proportions, was found buried in a ribbon-tied bit of cloth near La Noria’s Catholic church. It had well-formed teeth, nine ribs, and a strangely elongated skull. The tabloids in Chile joked about a “horrible dwarf extraterrestrial”, but no serious interest was shown in the “Atacama humanoid”. It changed hands a few times, eventually ending up in Spain. That’s where it came to the attention of Dr. Greer, an American ufologist best-known for founding the Disclosure Project. 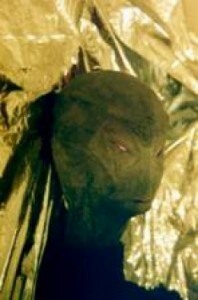 He probably heard about the humanoid during the Exopolitical Symposium held near Barcelona in 2009 (he was a presenter). Last year, he announced that his Center for the Study of ET Intelligence had gained access to the body, and would need funding to carry out scientific tests. 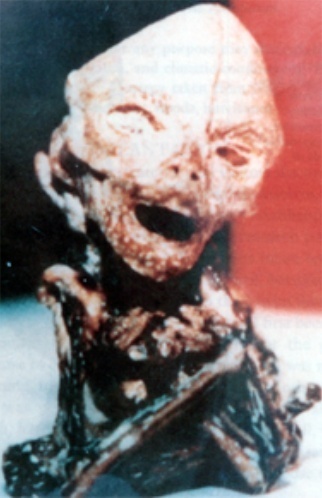 He released a single photo and an X-ray of the “humanoid”, failing to mention it had already been in the Chilean tabloid press nine years earlier. In late October, he announced the body had been examined by “experts” using X-rays and CT scans, but still wouldn’t release more photos or give the names of the scientists working with him. For a disclosure advocate, Greer doesn’t like to disclose much. He would only say that “one of the world’s top geneticists” was studying DNA samples from the alien, and the “world’s foremost authority on skeletal abnormalities” had pronounced the skeleton non-human. Throughout the ’90s, he claimed the ability to summon and communicate with UFOs using lights, lasers, and mental telepathy. In 2008, the Orion Project announced it was developing a free energy device. Delay after delay pushed its unveiling all the way to the spring of 2010, when the Orion Project declared the work could not continue until their funding needs were met (a mere $3 million or so). Greer repeatedly insisted the device was already functional, yet it has still not been revealed. Greer claims the secrets of aliens, free energy, and antigravity spacecraft are being kept from the public by a massive conspiracy possibly known as PI-40, comprised of Freemasons, Bilderbergers, the Trilateral Commission, the Council on Foreign Relations, and…uh…Mormons. He says most of his associates, including Eugene Mallove, were murdered because they came too close to the truth about aliens – just like Marilyn Monroe and former CIA director William Colby. He also thinks the government has possessed the capability to induce cancer from a distance since the 1950s. You would think the Atacama humanoid results would be big, big news in the world of ufology, but skepticism and disinterest remain high. I’m guessing this is partly because of Greer’s track record, partly because he won’t even release the names of these world-renowned scientists, and partly because we’ve been through all this before. Since the ’50s, we have been subjected to a veritable parade of alien fetuses, alien autopsies, alien skeletons and alien skulls – nearly all of which turned out to be terrestrial. Let’s take a quick look at some of the alien corpses of years past. Be warned that a few of the photos are kinda gross. It’s a bird. It’s a plane. It’s a bald monkey. Supposedly a film of doctors conducting a peculiar autopsy on an alien killed in the Roswell crash of 1947, the film turned out to be precisely what it looks like: A hoax utilizing rubber aliens, animal parts, and raspberry jam. 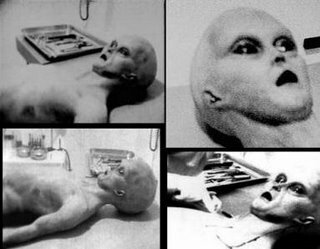 The owner of the footage confessed to fakery, but stubbornly insists it was a “recreation” of genuine Roswell autopsy footage that is too damaged to be shown. Protip: Fake aliens always look more real if you stick ’em on a space blanket. You could probably compose several novels, an entire History Channel series, and an opera out of the hilariously dumb saga that is the “Dr. Reed” hoax, in which a Seattle psychologist enthralled Coast to Coast AM listeners with his tale of encountering a landed triangular spacecraft in the Cascades, watching a very fast alien vaporize his dog, then capturing the alien and stuffing it into his freezer. 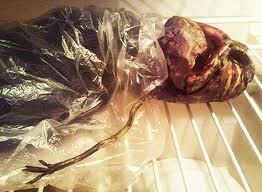 The alien wasn’t quite dead yet, however, and let out a horrifying shriek when Reed opened the freezer. Reed claimed the body was stolen by government agents who continued to stalk and menace him (though they somehow forgot to confiscate his photos of the UFO and the frozen alien). 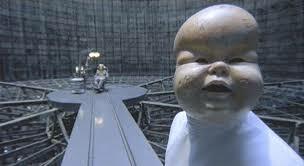 In 1999, American novelist Lloyd Pye purchased what is probably the skull of a hydrocephalic child. But he’s pretty damn sure it’s an alien-human hybrid, and won’t stop talking about it. I prefer them medium rare. Basically the same as the American autopsy footage, this film was said to have been taken in the former Yugoslavia in 1966. In photos sent to UFO Casebook by one “Ivan Kremer”, doctors are shown examining the charred corpse of an alien, supposedly recovered from a crashed UFO in the village of Otocek. Italian skeptic Andrea Zoboli later took credit for the hoax, citing the American alien autopsy as his inspiration. Might be Joan Rivers. Somebody check. The makers of this film were quite innovative. They opted for colour instead of black and white, chose a small alien dummy rather than a child-sized dummy, and zoomed in on the alien instead of standing ten feet away. The film even includes footage of Russian soldiers surrounding a crashed UFO that looks about as real as Tara Reid’s breasts. B for effort, guys. This is not to be confused with a “KGB” film that shows unmasked doctors hovering over random bits and pieces of an alien (judging by the hair on the lady doctor, this one was shot in the ’80s or early ’90s). The Siberian alien was probably the biggest dead alien story to hit the news since the American autopsy. Media outlets around the world carried stories of the cell phone video shot and posted to YouTube by anonymous teens, showing a pitifully one-legged alien entity sprawled in the snow. The Kremlin actually launched an investigation, and within hours an “alien” made out of old bread and chicken skin was found in the home of one of the kids in the video. Two boys confessed to creating it. At least put it in the crisper. This entry was posted in Fraud, Hoaxes, Hoaxes from Space, Impractical Jokes, UFOs, Wednesday Weirdness Roundup and tagged aliens, conspiracy theory, documentary, free energy, Freemasonry, hoax, media, Mormonism, publicity stunt, science, Steven Greer, TV, ufology. Bookmark the permalink. Mr. Lloyd Pye do not but the starchild skull! How do I know? I own it! You really need to do your research. Research means using multiple sources. Most colleges don’t allow students to use Wikipedia as a reference. I suggest reading the book. Contacting Dr. Ted Robison who is well respected facial plastic surgeon and does many facial reconstructions, Look at all the data on the web site and you will see that is a very unusal skull. We have never made any claims that it is alien. However we just want to know what it is! with something as irrational, arrogant and sensationalist thing like: “Everything You Know Is Wrong”. what they are saying is that the being had a native mother making it a hybrid. If you look at the star child testing results they speak the same conclusion. Interbreeding has been happening here since the Days of Enki and to dispute this would take away the only logical explaanation for the MANY ancient yet advanced. structures here on earth. I always thought this was a puppet, I’m surprised people believe it is even real! What most people fail to realise is that there really is no such thing as human DNA, that’s why I get angry when people accept we come from monkeys because we either resemble apes or because our DNA is so close??? Our DNA is shared with every life form on this planet including plants. We are actually closer to pigs then apes, and no matter how close we are even if it is 99%, just one percent difference would be astronomical. I don’t believe “god” created life, how can you have something before anything create everything out of of nothing including him/her/it’s self? You can’t, because the entire concept of god is illogical, however, the same can be said about the Big Bang and evolution, it doesn’t explain how life began or where matter came from. In other words anyone telling you they know what’s going on in this planet are full of it! Aliens are being created by the government in order to fake an invasion and unite/enslave/control humanity because religion has been exposed as nothing more then mythical representations and personifications for celestial bodies ie sun moon stars, and patterns of nature ie winter summer solstice and equinox! Also, the Big Bang doesn’t necessarily say that there was “nothing” before. So far as the Big Bang goes, there are several theories. That there was something before and now it’s our current universe, that our Universe is part of a larger system of some sort, that the entire universe was contained in a space the size of an atom at one point which couldn’t contain itself so it exploded into the universe, etc. None of them that I have heard imply a “nothingness” at the beginning of time. That tends to be an oversimplification from people not involved in the sciences. Now, to address your problem with “we come from monkeys.” That is, again, an unscientific oversimplification. The theory of evolution actually states that we and monkeys/apes/other primates share a common ancestor. That is, there was one species that, over millions of years due to changing climate, physical separation, or other factors, changed into several. These new species still shared some of the same DNA but were so different that they were no longer able to reproduce with each-other. communicate, or in some cases even resemble the original species. On your “aliens are being created” I just have to ask, if Aliens were being created by the government, wouldn’t we “see” more of them? There is no fake invasion, there is no real invasion. Oh, and I’m perfectly happy with my mythical representations and personifications of celestial bodies and nature patterns thank you very much. We share 35% of the nearly 7,000 tested protein families with the algae Chlamydomonas and flowering plants. Does that mean we had plant ancestors too? The Big Bang doesn’t explain how life began was my argument, saying something was there before the BB just raises further questions, it doesn’t solve anything. And I don’t need to list how many staged UFO events there have been, Temple Mount being one light show for example. Plus there are documents proclaiming the FBI has engaged in kidnapping people and making it look like they have been abducted by aliens. They even implanted microchips, now who wants to implant you with microchips? Aliens…. Or the government? Actually yes we do share a common ancestor with plants. You have to remember that when talking about evolution common ancestors go all the way back to when all life was single cell. That’s where I differ with evolution! Really. Everything you just said is so naive it truly amazes me and not in a good way. Do you know nothing of science. Really if you are going to say everything that you just have you need to be educated first. The purpose of science is not just to explain our creation to you. Its purpose is to explain and describe natural phenomena. Second you are confusing a theory and a hypothesis, a theory is the closest thing we have to fact that explains something that contains all supporting evidence, it really means a lot if a hypothesis or hypotheses become a theory. Also a law is just a repeated observation with no explanation for why it happens. You are truly ignorant to say what you have just said both about science and religion. Science is so widely used because of its effectiveness and its concrete foundations and it is NOT to be taken lightly!!!!! Now onto your statements. To begin the Theory of Evolution has never in over 150 been contradicted. DNA is a very real thing, I have extracted and worked with it many a times. All DNA, comparative morphology, fossils (including transitional species), embryology, and much more point with almost certainly that life did indeed evolve. Also one of you statement saying Evolution doesn’t explain how life began. Pointless seeing as Evolution doesn’t try to it is about how life evolved after the fact. Next by viewing simple cladistics (found in any text on biology and proven by various institutions) we share a COMMON ANCESTOR with other great apes this is DIFFERENT from sharing a direct ancestor with them we are what they call their RELATIVE. Next we are not more closely related to pigs that is pretentious and ludicrous down to its core. If you have any questions Google what I wrote. Now onto you complaints with the Big Bang Theory. First, there are many other THEORIES out there. For instance the big bounce Theory in which there is a periodicity to the universe expanding and contracting until a point very close to being a singularity (Google this term if not familier), many more also exist. Personally I think other theories better incorporate rather new observations dark matter/energy etc. Although, I do applaud and enjoy its explanation of the Cosmic Microwave Background, but other do it better. This is mainly because of its age it was first hypothesised when a lot of the physics around today did not exist and so it has had to be patched and changed to include new observations. Yet again the Big Bang Theory DOESN’T TRY AND EXPLAIN WHY THE UNIVERSE BEGAN (by what you wrote that is obviously the context to which you meant it) it is explaining objectively observed phenomena. Moving on THE SAME CANNOT BE SAID ABOUT GOD EVOLUTION OR THE BIG BANG THEORY religion is not science it cannot be tested or proven science can. You really really really need to team proper science text and it imperical literature. YOU ARE SLAPPING SCIENCE IN THE FACE WITH YOUR OBSCENE COMMENTS!!! And frankly I am offended. In as friendly as possible you need to forget everything you know about science and go buy some proper books on the subject. Or you will never be taken seriously. Finally onto your comments about religion. Personally I do not believe in god, but I know other people do and I respect that by not trying to poke or disprove it. Its called faith for a reason. You cannot disprove religion by saying it is illogical. That is the same as saying evolution is not true because it contradicts god. By saying what you did you are no better than the people you are arguing with. Let me say I am only 16 but however old you are you have much to learn. Good luck! I really do apologise for the condescending tone. It was around and rude of me, I’m just to lazy to go back to change it. If you want to talk this through further comment again and ask I will give you my email. Well you just proved my point, evolution and or god do not prove how life began, and neither does saying aliens exist. Santa clause isn’t real either by the way! In no way did I prove your point. None of the scientific theories that you stated work formulated to explain how life began. And thusly they are not illogical (you said that they were illogical in yours original post). Now by viewing the MANY Theories specifically to explain how life may have began. JUST BECAUSE SOMETHING IN SCIENCE IS NOT CURRENTLY PERFECT YOU CANNOT SAY THAT IT IS ILLOGICAL!!! For instance evidence from earth primordial soup, hydrothermal vents, etc. Just Google it or buy a book. At this point I can only think you are posting this trying to make people angry and get a laugh. YOUR LEVEL OF SCIENCE YOU UNDERSTAND IS ZERO! YOUR PATHETIC EVERY THING YOU ARE SAYING IS IDIOTIC! It is so clear why you are saying what you have your trying to be original by saying something different. To get attention for yourself. YOUR NOT ORIGINAL YOUR NOT INTELLIGENT. YOUR PATHETIC NAIVE STUPID AND HAVE A 3 YEAR OLDS UNDERSTANDING OF SCIENCE. So stop trying to be smart your not. Excellent Research my friend! In this “age of reason” of us, most likely “age of delusion” its amazing how scientific minded individuals are so criticized and ostracized by ignorant pseudo scientific people, like the one who posted the comment below. In my website (you are kindly invited to check it out) I always get this type of comments 1 rational comment VS 10 rude, narrow minded ones coming from equally minded individuals. Thumbs up and I will be following your blog! doesn’t matter what the body Greer’s team is testing , by the way they are some pretty high powered science people , the gov. does in fact have alien technology including propulsion . This has been documented by multiple sources. Do you honestly think hundreds of peolple with past gov. and military clearances are going to risk their reputations , safety and safety of their families to promote a scam ? You really need to get out more. 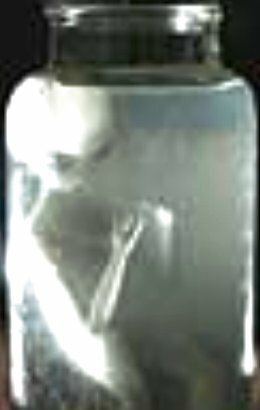 I myself have a picture of a ufo taken with my own digital camera , this craft was invisible to the eye by the way, but the camera was able to record the spectrum range my eyes could not see at night. Looks just like the ones flying around the broken teather at the space station in the nasa footage. You only need to open your eyes , but don’t worry , soon this will be so obvious , it will be impossible to deny. You are a really ignorant type of individual. Honestly, please research before believing! Why do you say so many irrational and pseudo-scientific things? I quote you: “Interbreeding has been happening here since the Days of Enki” Who told you this ridiculous thing, let me guess: Zecharia Sitchin right?, a fake linguist infamous for his silly apocalyptic and ancient aliens books. Gullible people like you gives a bad name to modern humans. Lachmann and Nolan reports on ATA seem very serious, and it is obvious that both are pretty baffled and have no clue. Are they real people with real credentials? Being a skeptic myself, I would like to read your further comments now that scientists names, university, etc. are known. What are talking about, J? Nolan and Lachman say the Atacama humanoid is a human with interesting mutations. They seem far from clueless about the humanity of the “humanoid”. The only mystery is how it survived into childhood. If it’s a fake, it’s a very good one to get past these guys after CAT scans and X-rays. If it’s not, it’s apparently still very human, albeit very odd – possibly very rare genetic disorder? Who knows? I’m holding judgement until someone demonstrates either way. What are U talking about E.? Did you read the whole post? It not only questions Greer himself, -what is now rather irrelevant- but also makes fun that names of “scientists” were not revealed nor additional pictures given. Regarding the “humanity” of the humanoid, do you really believe that the only mystery is how he or she survived? Don’t you see anything different from us humans? Have you seen these guys lurking around your neighborhood? Neither Nolan nor Lachmann confirmed it is a human. They only suggested that the sofar available DNA sequencing (only about 17pct) was rather similar to humans. Please keep in mind that all apes are 97 to 99% human as well. They both agreed that there is no definitive answer until at least 50% sequencing is completed. Suggesting that it is actually a number of mutations (all piled together successfully into one individual) sounds like the only workable excuse of someone who is completely baffled. 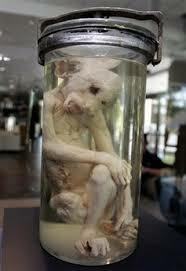 My point was not to suggest that this was an alien (by the way, how would they know what is the aliens’ DNA?.. haha) but to point out that arguments (shaved capuchin monkey or fake alien made out of old bread and chicken skin) seem now ridiculous compared to the ATA. Both Lachman and Nolan have stated, unequivocally, that the “humanoid” is human. they did not state the humanoid was human , they stated the mother was an indian from the local area of Peru but there were many anomalies unexplained . One must keep in mind ,these are mainstrean university science people speaking , and the general atmosphere in that community is not to deviate from “funded” thinking , thus most are hesitant to come out and say what they really see. What i walked away with was , the guy wanted to say there were things unexplainable but didn’t want to connect the dots in the public eye. If you look at the star child dna results , the sameis true , human mother HYBRID . When is the last time you encountered of read about a 6 inch tall “humanoid” that looked anything like that being??? The problem with it being hybrid is that generally only really close related species can interbreed. If the father comes from a different star system then it is simply not reasonable to expect that it is possible for there to be viable offspring. If I understand correctly the male DNA is that it is not so much unidentified as unidentifiable ie – it has degraded too badly to be identified. – the alien is virus like and insuates itself via something akin horizontal gene transfer. If you had a lot more cases that looked like this and DNA that was actually unidentified and not unidentifiable I would grant this as a possibility. Of course it would not be necessary for such an organism to have originated from elsewhere in the universe. – The father is a human who some how developed technology to travel to the stars in relatively recent earth history – it has to be that way around as humans are clearly closely genetically related to other species on earth (even the trees) and it looks that way for at least the last several billion years. As cool as this sounds you are going to need some really serious evidence that this was even possibly so. – The father is an alien from another planet who just so happens to line up genetically with humans. Even compared to the above option this one is astronomically low. if a race of people can traavel through star systems , I don’t see it unreasonable to think they have a great ability to manipulate dna . You might want to read the book of Enki , thousands of years older than the bible, yet the clay tablets this info was taken from display a people much more advanced than we are today and did in fact take part in direct genetic manipulation. It also explains or connects the dots of how many of the ancient giant incredible stone structures were constructed , ie pyramids of Giza , Puma Punku. A fascinating mystery, but a human one. Please read the second sentence carefully, essemee. Don’t you see that Mr. Nolan relativizes the apparent result “it is human” by adding “closer to human than chimpanzees”? This means that Ata is closer to human than the 98.5 % DNA accordance of a chimpanzee. This does not mean that it is necessarily 100 %; it could be 99 % or 99.5 %. We should all wait for the final results of the sequencing instead of drawing unjustified conclusions. Hugely amusing, especially the comments (bless). Thanks for brightening my morning! Very good summary of the hoaxes. And I get a chuckle out of the pseudo-scientific comments…very entertaining. 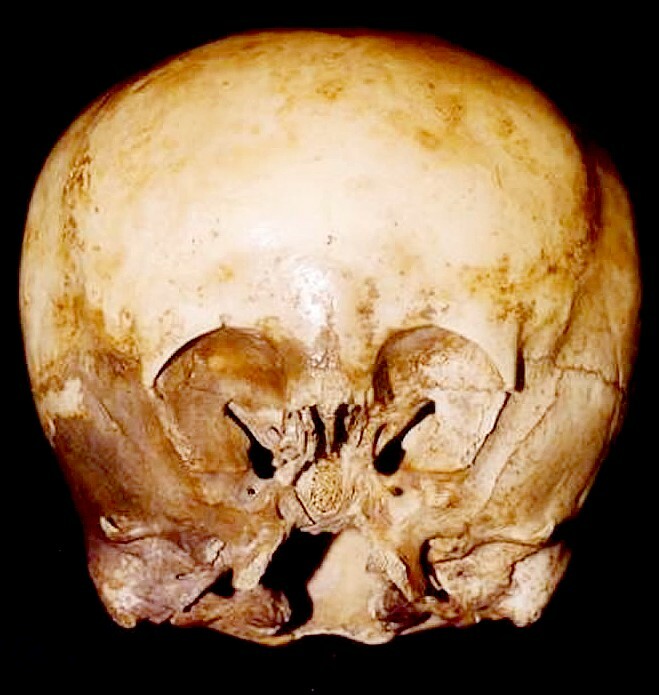 When you learn of the whole story of the Starchild skull (Bad Archaeology has a pretty thorough write-up), for example, you understand how much is being hidden from serious scientists, how much is made up and how much is intentionally distorted to try to keep alive the notion that there are aliens involved. You can easily tell these are fake because they look so human-llike. Like most aliens on TV shows like “Star Trek”, they’re basically just the human form modified in some way. Not like something evolution on a different planet would actually produce. As for “hybrids”, as Carl Sagan once pointed out, a human would more easily be able to interbreed with a petunia than with a completely unrelated organism that evolved on another planet. What staggering ignorance of biology. you are missing the point ,a hybrid doen’t always imply breeding , it is done all the time by man to other organisms ,would not life forms more advanced than our own have the capacity to carry out this science ? If they are able to conquer the physics of interstellar travel , genetic manipulation would likely be possible and again , our own ancient records here on earth reveal that very thing. Why is that so hard to grasp , it certainly connects the dots that conventional science has not been able to. If the prolem is God , these beings that are said to have carried this out in the bringing about of homo sapiens believed themselves they had been directed by the finger of God to do so. The human dna also has a graft portion that mainstream science is unable to explain , but it sure looks like a graft or splice , does not look like the normal interwinding dna structure. to think we are alone in this vast universe of ours is not only arrogant but absurd. i do not know how much truth there is behind the disclosure project but i do believe we’ve been visited in the past and we ARE being visited now. asking for evidence? there are tons of good evidences in the web not to mention the fakes as well. but with a little common sense i’m sure you’ll be able to figure out which are the nonsense and which have the potential of being true. It’s FAKE. I don’t care who or what credentials are put forth to try and say it’s otherwise. It’s clearly a prop made from organic materials. FAKE, FAKE, FAKE. To push the “alien disclosure” agenda. If there are any beings disclosing themselves they will be demonic, (fallen angels) posing as extraterrestrials. Wake up people and step outside the paradigm. There is a 2,000 year-old book which tells all of us how we came to exist. That book talks about supernatural entities both good and evil and that there does exist other beings besides ourselves in the universe. That very book tells us about the supernatural being who created us and it doesn’t have anything to do with a fictional “Nibiru” or “Enki” or ET. That being has many names and he is a good being, not evil. He doesn’t “abduct” and “experiment” on people and terrify them. The ones who abduct and terrify are the fallen ones, the sworn enemy of the good being who created us. That’s why the good being sent the prince of his kingdom to rescue us from the fallen ones. We have been offered a direct connection to the being who created us – through our hearts and minds. We’re asked to help each other do this, recognizing the one who saved us from the fallen ones. The being who created us gives life and helps us overcome evil and we are to become like our creator, looking toward a day when the fallen ones will be defeated forever and cast away. If that’s not supernatural, I don’t know what is. So call the vatican for a visit in his top secret library. If something is top secret, what does it mean? I don’t know, your 2,000 year old book seems kinda fishy to me. I’ve heard older stories that say we were danced into existence by two divine entities. OR there is the story about the cow which created the universe by licking a rock (don’t ask). Or the one that says we were crafted of mud, stone, etc. Or the one where we’re a grand experiment by a family of divine beings on a mountain top. Or there are newer stories that make more sense too, like the one where we evolved slowly over millions of years. Or the one where a flying spaghetti monster reached down and created us all with his noodley appendages. Great photos posted here and explanations…Who is this, Dr.Steven Greer and where did he come from? I’m guessing he’s another flunky trying to slam/dunk his way to fame & fortune like the Media did with Obama. Google Dr.Steven Greer and you will find an abundance of information on his life, esp his commitment to the UFO disclosure agenda that outlines truly alarming scenarios.. It has been in the (selfish) interest of most scientists worldwide to continue to absolutely deny the existence of other life forms (ETs) outside our planet because to admit their existence would be to fear having to rethink some of their long held theories on physics, biology, etc. God forbid that our planet should ever have to experience such a devastating event such those proposed in Dr. Greer’s disclosure scenarios, but I have followed this subject for many years and I believe Dr. Greer to be very credible in his assertions. It behooves us all to take this subject more seriously before it is too late. Most scientists actually accept the possibility of intelligent life on other planets just by the probability alone. 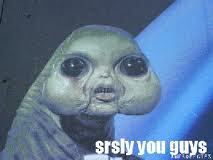 Uncountable billions of planets and star systems and we’re the only one with intelligent life? Simply not probable. How many sheeples surf the internet? I think almost 70% of internet viewers are sheeples. Every genuine UFO disclosure evidence/video will have a profusion of profane comments of disbelievers. How to make them believe? I think their great grand-children will make them believe (the hard way). Somehow Dr. Greer seems to have convinced a large number of credible-type people to publicly state that they’ve seen UFO’s: http://disclosureproject.org/index.shtml. Very strange. Laughing helps us cope, but I hope we’re not being disrespectful to people who are volunteering to testify to congress under oath. I can’t imagine that they’re all liars or crazy or deluded. Maybe there’s some weird angle that I haven’t thought of yet. Probably so, but at the moment, the more I look into this stuff, the more convinced I am that UFO’s and the people who say they’ve seen them are worth taking seriously.